Objective(s): In patients with local or regional recurrence of squamous cell carcinoma of the oropharynx after primary treatment with radiation therapy (+/- concurrent chemotherapy), the chance that salvage surgery will be successful is the critical issue for determining when to recommend salvage surgery and how intensely to follow patients after initial radiation therapy. Methods: We reviewed the medical records of 137 consecutively treated patients with recurrence in the primary site and/or neck following primary radiation therapy with curative intent at our institution. Overall survival was assessed using the Kaplan-Meier product limit method. The log-rank test statistic was used to detect any statistically significant differences between strata of selected explanatory variables. Results: The salvage success rate was 12% and the salvage surgery success rate was 37%. Only 3% of patients with neck-alone recurrences were salvaged vs. 18% with recurrences limited to the primary site. Symptoms led to the detection of the initial recurrence in 84% of cases. Conclusions: While our series suggests that recurrent head and neck cancer patients have a low success rate with salvage therapy, this series represents a heterogeneous patient population with a variety of treatment paradigms. Due to the complexity of this patient population, a multidisciplinary approach to care is recommended with decisions made on a patient-specific basis with incorporation of the newest treatment modalities. For a patient with newly diagnosed recurrence of oropharynx cancer after primary radiation therapy (+/- chemotherapy), the success rate of surgical salvage is important only if that patient is eligible for the procedure. Existing series focus on the technical aspects of a good surgical outcome, but while this is critical for the patients taken to the operating suite, it is only one element in the decision of the multidisciplinary tumor board in assigning a care recommendation. Almost monthly, our head-and-neck oncology group struggles with whether to recommend salvage surgery to a patient with squamous cell carcinoma of the oropharynx that has recurred in the primary site and/or neck following radiation therapy (RT). A separate debate is the frequency and intensity of follow-up of our oropharyngeal cancer patients after primary RT. The answers to both questions hinge on the chance that salvage surgery will be successful in this setting. Most publications on salvage surgery focus on patients treated primarily with surgery, pool patients with a diverse range of primary sites, or report only on the patients who underwent a salvage attempt. The purpose of this paper is to contribute to the literature by reporting overall and attempted salvage success rates in a well-defined group of oropharyngeal cancer patients with long-term follow-up after primary RT (+/- chemotherapy), at our institution. Patients were retrospectively staged T0-4, N0-3 using the criteria described in the 7th edition of the American Joint Committee on Cancer’s staging manual.2 We limited the analysis to patients who started primary RT after January 1, 1985, because this defines the era in which high-quality cross-sectional imaging was routinely done as part of the workup for head-and-neck cancer patients at our institution. The end date for study accrual was the start of primary RT before December 31, 2005, to ensure that all patients had at least 5 years of follow-up after local and/or regional recurrence. During the study’s timeframe, most patients did not have the tumor tested for p16 or human papilloma virus (HPV) status and the only salvage approach undertaken with curative intent was surgery. Our initial review yielded 143 eligible patients with local and/or regional recurrence, but 6 patients were excluded because we were unable to obtain reliable information regarding recurrence location and the cancer outcome. Thus, our study population is 137 patients. The 137-patient study population was 82% male (113 patients) and 82% white (112 patients), with age at the time of RT ranging from 44 to 78 years (median, 60 years). Subsite distribution within the oropharynx was as follows: tonsil, 58 patients; base of tongue, 35 patients; posterior pharyngeal wall, 21 patients; soft palate, 16 patients; vallecula, 1 patient; and unknown (T0), 6 patients. Initial treatment for all 137 cases included RT delivered with curative intent in our department. The fractionation schedule was 1.2 Gy twice a day in 82% of cases (112/137) and 2.0 Gy once a day to gross disease in the remaining 18%. The total prescription dose to areas of gross disease was 62 to 84.4 Gy with a median of 74.4 Gy. Electively treated areas received at least 50 Gy. Chemotherapy was delivered in addition to RT in 20% of patients (28/137). The indication for chemotherapy was large-volume adenopathy and/or a T4 primary. In all cases the chemotherapy was delivered only during the course of RT. The chemotherapy regimen was as follows: weekly cisplatin (13 patients), 30 mg/m2; cisplatin and fluorouracil (5FU; 9 patients), 20 mg/m2/day and 1000 mg/m2/day x 4 days twice during RT; carboplatin (3 patients), 60 mg/m2 × 5 days twice during RT; and weekly carboplatin and taxol (3 patients), area under the curve (AUC) 1.5 and 45 mg/m2, respectively. A planned neck dissection for residual adenopathy on computed tomography (CT) scan done 4 to 6 weeks after RT was performed in 41% of patients (n = 56). Of these 56 patients, 7 (13%) had a pathologically positive neck dissection specimen. The follow-up schedule following primary RT (+/- chemotherapy) was clinical examination by a radiation oncologist and/or head-and-neck surgeon every 3 months for the first 2 years, every 6 months during years 3 to 5, and then annually until death or loss of follow-up. Computed tomography (CT) scanning in asymptomatic patients was not done routinely. Successful salvage was defined as the absence of a second recurrence of oropharyngeal cancer during the follow-up period at any site, except for the rare situation in which a patient developed a distant metastasis alone more than 2 years after salvage surgery, with no evidence of local or regional recurrence. Our rationale for coding late distant metastasis-alone cases as successful salvages is that the patient benefited from the salvage procedure for a substantial period. Patients who died of surgical complications or intercurrent disease without recurrent cancer within 1 year of salvage surgery were coded as salvage failures since the surgery and its attendant morbidity did not benefit the patient. Our primary study endpoint was the salvage success rate (successful salvages/137). Our secondary endpoints were the salvage attempt rate (attempted salvages/137), salvage surgery success rate (successful salvages/attempted salvages), and survival following initial local and/or regional recurrence. For the actuarial survival plot, an event was defined as death from any cause. All statistical analyses were performed using SAS and JMP software (SAS Institute, Cary, North Carolina). Overall survival was assessed using the Kaplan-Meier product limit method. The log-rank test statistic was used to detect any statistically significant differences between strata of selected explanatory variables. All but 3 patients were followed until their death. The remaining 3 are alive without cancer over 5 years following their last cancer treatment. Living-patient follow-up after the date of initial local and/or regional recurrence ranged from 0.4 to 23 years with a median of 3.4 years. Table 1 summarizes the salvage success rates. The overall salvage success rate was 12% (16/137), the overall salvage attempt rate was 31% (43/137), and the overall salvage surgery success rate was 37% (16/43). Salvage surgery was not attempted in 94 patients for the following reasons: unresectable local/regional recurrence (53 patients), distant metastases at the time of detection of local/regional recurrence (18 patients), patient refused (14 patients), medically inoperable (7 patients), and unknown reason (2 patients). The 43 patients for whom salvage was attempted underwent one of the following operations: wide local excision with or without neck dissection without reconstruction (23 patients), composite resection with or without flap reconstruction (10 patients), laryngectomy with neck dissection (1 patient), or neck dissection alone (9 patients). The 27 patients for whom the salvage attempt was not successful included 3 patients who died of fatal complications from salvage surgery within 3 months of the procedure and 1 patient who died 6 months after salvage surgery from a problem that appeared to be unrelated to the salvage surgery or cancer. The remaining 23 patients developed recurrent cancer above the clavicles within 2 years of the attempted salvage surgery. Three patients who did not undergo salvage surgery were treated with re-irradiation with palliative intent. These patients died within a year of re-irradiation of progressive cancer. Tables 2 and 3 show the rate of successful salvage by T and N stage at the time of RT. Not shown in these tables is an evaluation of the possible influence of planned neck dissection or the use of chemotherapy. Understanding the limitations of a subgroup analysis in this setting, there was no clear indication that these factors were important determinants of salvage success in our study population. These tables also do not address positive surgical margins at the time of salvage surgery, which were found to be statistically associated with salvage failure (p = 0.0022). As there was only 1 successful salvage in the 36 patients with a neck-alone recurrence, it is not possible to identify a factor that predicts neck salvage success. The successful salvage was in a patient who had not undergone a planned neck dissection: 1/81 vs. 0/56. The time interval between RT and the first detection of a local and/or regional recurrence in the total study population averaged 10 months (range, 1 to 78 months). The average time intervals in each salvage subgroup were as follows: no salvage attempt, 9 months (range, 1 to 75 months); unsuccessful salvage, 17 months (range, 4 to 78 months); and successful salvage, 9 months (range, 3 to 27 months). The difference between these detection intervals was statistically significant (p = 0.0176). A time to recurrence of greater or less than 12 months, however, was not significantly associated on univariate analysis with successful salvage (p = 0.7374). 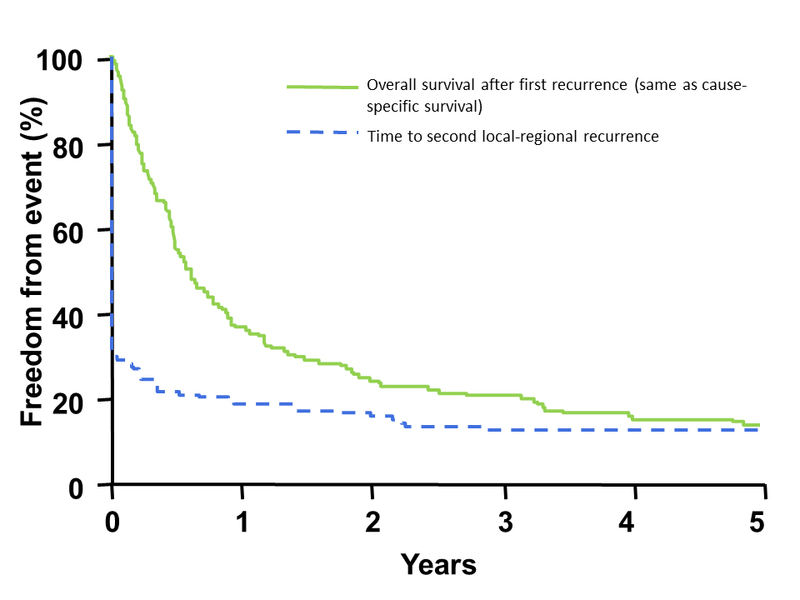 Figure 1 is an actuarial plot of overall survival following the initial local and/or regional recurrence by salvage status. Figure 2 provides the plot of outcome following the first recurrence, with patients in whom no salvage surgery was attempted shown as local-regional recurrence events at time 0. Table 4 shows data evaluating how frequently symptoms led to the detection of a local and/or regional recurrence. The most common symptom was pain at the site of recurrence, occurring in nearly all cases; also reported were a new mass, ulceration, dysphagia, otalgia, trismus, nasal congestion, and dysphonia. Not shown in this table is the rate of successful surgical salvage based on symptom status. Of the symptomatic patients, 13% (15/115) were successfully salvaged and all successes were in patients with recurrences only at the primary site. Of the asymptomatic patients, 6% (1/17) were successfully salvaged with the only success being a neck-only recurrence detected by surveillance CT scan. There were no successful salvages in the 5 patients whose symptom status was unknown. Table 5 summarizes the main publications that report overall rates of surgical salvage success for oropharyngeal cancer patients following primary RT.3-9 Not included in this table are series that focus on patients whose primary treatment was a surgical procedure or who combine patients treated with primary surgery and RT without separating the results10-12 or those that pool results from a wide range of primary sites.13-16 Our series provides the longest published follow-up in the literature regarding an entire population of patients with recurrence after primary RT for squamous cell carcinoma of the oropharynx. Most series focus only on patients offered surgery, but these data ignore outcomes for those who are not surgical salvage candidates, suggesting an unfairly optimistic prognosis after recurrence. The success rate of the procedure only matters to those who are eligible. The most important endpoint is found in the last column, Surgical Salvage Success Rate, which uses “total patients with local and/or regional recurrence” in the denominator of the calculation. Our finding that only 12% of patients were successfully salvaged is sobering, and this figure is very close to what other series have reported. We were discouraged to confirm our prior study showing that successful salvage is rare with neck-alone recurrences.4 Our value of 3% is lower than the 16% from Viani and colleagues,7 but given the heterogeneity of this patient population, both of these studies support the conclusion that the chance of successful salvage is especially low in patients with recurrence confined to the neck, as shown by imaging studies. We did not have specific criteria for selecting patients for salvage surgery, but we believe our series reflects the culture of most tertiary-care head-and-neck oncology groups. No other publication, to our knowledge, describes prospective guidelines for attempting salvage surgery. This reality likely explains the range of salvage attempt and surgery success rates among the published series. Our salvage surgery success rate of 37% is slightly higher than most other series except for the outlier result of 60% from White and colleagues, which pools the results from multiple institutions and is almost exclusively limited to patients whose local recurrence appeared to have a good chance of cure with transoral robotic surgery.3 It is therefore likely that patient selection bias explains the relatively high surgery success rate in our analysis. We attempted to evaluate the influence of major factors likely to affect the chance of successful salvage. The value of these analyses is limited by small numbers within each subgroup and the inability to control for confounding factors. Given these limitations, we found that salvage of a primary-site-alone recurrence was inversely related to initial T stage, but even with an initial stage of T4, the chance of successful salvage is not 0. With only 1 successful salvage in patients with a neck recurrence, it is not possible for our data to determine whether secondary factors, such as initial N stage or extent of neck recurrence, influence the salvage success rate. No series, including ours, evaluates salvage rate by p16 or HPV status. Our guess is that knowing HPV status would not change the main findings in our study because the number of successful salvages was so low and because it is likely that recurrence after RT identifies a poor prognosis subtype of HPV-associated cancer. 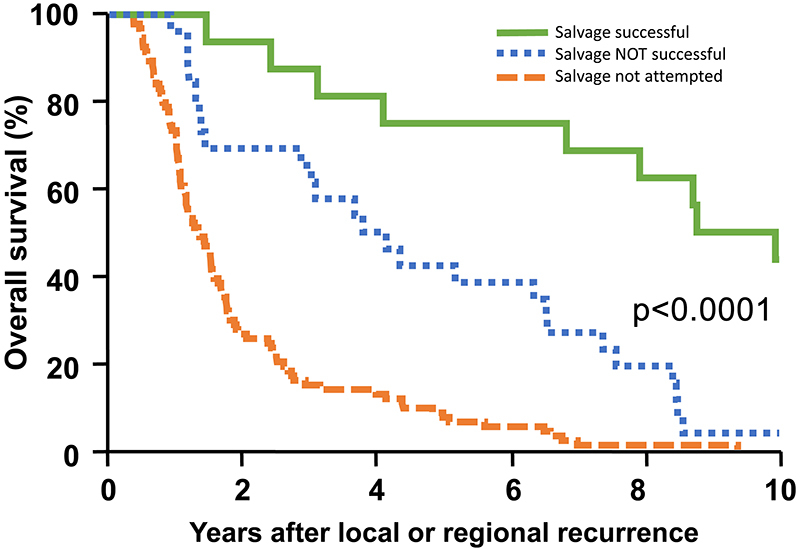 The overall survival results in Figure 1 support the value of attempting surgical salvage when it is likely to be successful because the great majority of patients who are successfully salvaged live many years after the salvage surgery (5-year survival approximates 75%). Another finding is that, when patients are not successfully salvaged, a substantial percentage of patients live for years with palliative management (often including chemotherapy and additional RT). We interpret the difference between the “salvage not successful” and “salvage not attempted” curves to be the result of patient selection vs. unsuccessful surgery. The finding that the great majority of local-regional recurrences are symptomatic, combined with a low rate of successful salvage, questions the value of following asymptomatic patients frequently when the purpose of follow-up is recurrence detection. It is possible that more rigorous follow-up programs would detect recurrences earlier such that the salvage success rate would be higher, but our data do not inform this question. As a result of our findings, most of the physicians in our program are lengthening the follow-up interval to fit with the management of treatment-related toxicity. Our usual follow-up program is now clinical examination with CT of the neck and chest every 4 months in the first year, every 6 months for the next 2 years, and annually thereafter. While our series suggests that recurrent head and neck cancer patients have a low success rate with salvage therapy, this series represents a heterogeneous patient population with a variety of treatment paradigms. Due to the complexity of this patient population, a multidisciplinary approach to care is recommended with decisions made on a patient-specific basis with incorporation of the newest treatment modalities. Based on our finding, we are highly selective in the patients for whom we recommend a major salvage surgery and we explain the basic results of this study as part of the consent process when a salvage procedure is being offered. We do not have bright-line selection criteria. The main influence of our study has been to make it so that we do not offer salvage surgery in patients with cardiovascular problems that put them at high risk for major head and neck surgery or in patients with neck disease around the carotid that puts them at high risk for a vascular complication from complete tumor resection. The finding that the great majority of local-regional recurrences are symptomatic, combined with a low rate of successful salvage, questions the value of following asymptomatic patients frequently when the purpose of follow-up is recurrence detection. It is possible that more rigorous follow-up programs would detect recurrences earlier such that the salvage success rate would be higher, but our data do not inform this question. As a result of our findings, most of the physicians in our program are lengthening the follow-up interval to fit with the management of treatment-related toxicity. Our usual follow-up program is now clinical examination with CT of the neck and chest every 4 months in the first year, every 6 months for the next 2 years, and then annually thereafter. Tanzler ED, Amdur RJ, Morris CG, Werning JW, Mendenhall WM. Challenging the need for random directed biopsies of the nasopharynx, pyriform sinus, and contralateral tonsil in the workup of unknown primary squamous cell carcinoma of the head and neck. Head Neck. 2016;38(4):578-581. American Joint Committee on Cancer. AJCC Cancer Staging Manual, 7th ed. New York: Springer; 2010. White H, Ford S, Bush B, et al. Salvage surgery for recurrent cancers of the oropharynx: comparing TORS with standard open surgical approaches. JAMA Otolaryngol Head Neck Surg. 2013;139(8):773-778. Mabanta SR, Mendenhall WM, Stringer SP, Cassisi NJ. Salvage treatment for neck recurrence after irradiation alone for head and neck squamous cell carcinoma with clinically positive neck nodes. Head Neck. 1999;21(7):591-594. Regueiro CA, de la Torre A, Valcarcel FJ, Magallon R, Aragon G. Salvage brachytherapy and salvage surgery for recurrent oropharyngeal carcinoma following radiotherapy. J Laryngol Otol. 1995;109(1):45-48. Gehanno P, Depondt J, Guedon C, Kebaili C, Koka V. Primary and salvage surgery for cancer of the tonsillar region: a retrospective study of 120 patients. Head Neck. 1993;15(3):185-189. Viani L, Stell PM, Dalby JE. Recurrence after radiotherapy for glottic carcinoma. Cancer. 1991;67(3):577-584. Wong CS, Ang KK, Fletcher GH, et al. Definitive radiotherapy for squamous cell carcinoma of the tonsillar fossa. Int J Radiat Oncol Biol Phys. 1989;16(3):657-662. Zafereo ME, Hanasono MM, Rosenthal DI, et al. The role of salvage surgery in patients with recurrent squamous cell carcinoma of the oropharynx. Cancer. 2009;115(24):5723-5733. Pradhan SA, Rajpal RM, Kothary PM. Surgical management of postradiation residual/recurrent cancer of the base of the tongue. J Surg Oncol. 1980;14(3):201-206. Sultan MR, Coleman JJ, 3rd. Oncologic and functional considerations of total glossectomy. Am J Surg. 1989;158(4):297-302. Joseph AW, Guo T, Hur K, et al. Disease-free survival after salvage therapy for recurrent oropharyngeal squamous cell carcinoma. Head Neck. 2016;38 Suppl 1:E1501-1509. Goodwin WJ, Jr. Salvage surgery for patients with recurrent squamous cell carcinoma of the upper aerodigestive tract: when do the ends justify the means? Laryngoscope. 2000;110(3 Pt 2 Suppl 93):1-18. Fleming WB, Long TM. Results of the surgical treatment of selected patients with squamous cell cancer of the mouth and throat. Aust N Z J Surg. 1978;48(6):610-612. Janot F, de Raucourt D, Benhamou E, et al. Randomized trial of postoperative reirradiation combined with chemotherapy after salvage surgery compared with salvage surgery alone in head and neck carcinoma. J Clin Oncol. 2008;26(34):5518-5523. Jones AS, Bin Hanafi Z, Nadapalan V, Roland NJ, Kinsella A, Helliwell TR. Do positive resection margins after ablative surgery for head and neck cancer adversely affect prognosis? A study of 352 patients with recurrent carcinoma following radiotherapy treated by salvage surgery. Br J Cancer. 1996;74(1):128-132. National Comprehensive Cancer Center Network (NCCN) Guidelines Version 2.2018. Head and Neck Cancers. 2015; https://www.nccn.org/professionals/physician_gls/pdf/head-and-neck.pdf. Accessed August 30, 2018. Hitchcock KE, Amdur RJ, Dziegielewski PT, Morris CG, Mendenhall WM. Surgical salvage of oropharyngeal cancer with local-regional recurrence after primary radiation therapy. Appl Rad Oncol. 2018;7(3):26-32. Dr. Hitchcock is an assistant professor and Dr. Amdur is a professor in the Department of Radiation Oncology, University of Florida College of Medicine (UFCM), Gainesville, FL. Dr. Dziegielewski is an associate professor in the Department of Otolaryngology, UFCM. Mr. Morris is a biostatistician, and Dr. Mendenhall is a professor in the Department of Radiation Oncology, UFCM.